We hope you enjoy your visit with some of our dogs that have given us and others much pleasure over the years. 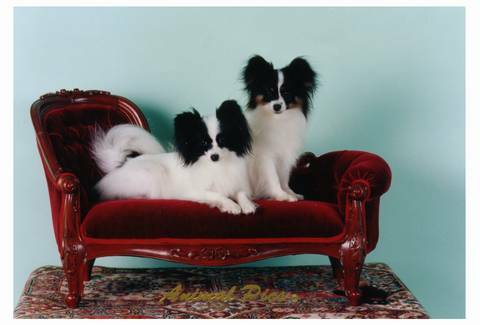 Basilika kennels was established in 1969 by Lydia together with daughter Christina and Papillons joined the family in 1977. Basileus was established by Chris in 1990. Today Lydia, daughter Chris and granddaughters Kaitlynn & Alexandra are proud to breed and exhibit these delightful dogs. We believe in breeding healthy dogs and hence we test for von Willebrands Disease Type One, PRA1 & NADS. All of our dogs have been DNA profiled and tested and are clear of the above diseases. We occassionaly have puppies and older dogs available to loving homes. Please feel free to contact us. This site is a work in progress and will be updated from time to tome. 08.01.10 BIS MBISS Aust Grand Ch Basilika Jordan Star announced Dogz On Line Best of Breed Papillon winner for 2009 and also National Breed Winner (All Breeds Competition).